In the early years, launching boats and conducting business on the Noquochoke (East Branch of the Westport River) was relatively straightforward. Boats were generally of the smaller variety, and the unique locations of launching points and river crossings did little to impact the boatbuilding business. With the advent of the whaling industry and need of larger sea-going vessels and navigational restraints, the challenges to the shipbuilder and the trade became more apparent. In the late 1700’s, a concerted effort was made to fortify the northern banks of the approaches of Noquochoke at the Head of Westport, to aid in trade and navigation. To help maintain the banks during the daily ebb and flow of the river, granite barriers were installed on either side of the waterway. As it is today, the resulting walls that defined the channel proved to be a challenge for any builder hoping to launch a vessel of any size longer than fifty to sixty feet. In spite of the gentle slope of either side of the public landing, which was ideal for shipbuilding, launching larger vessels such as the Phebe Anne, Industry and others took careful planning, coordination with extreme high tides, and old-fashioned Yankee ingenuity. Assuming Mr. Pierce’s recollection is accurate, one can imagine how this entire operation might have looked. Presumably, most launches at the Head took place at a ‘moon tide’ when the river was at its pinnacle. And, one can surmise, in this tiny community where nearly every person was vested in shipbuilding activities, the launch of any new vessel encouraged a celebratory mood by everyone in town. For these occasions, along with families, friends and revelers were shipwrights, carpenters, shipsmiths, coopers, and farmers with their oxen teams preparing to launch a seaworthy but generally unfinished vessel. Final fitting-out including masts, interior joinery, ballast, and rigging was typically accomplished further down river south of Hix Bridge or at Westport Point, after the vessel had traversed the seemingly impassable Hix Bridge. As teams on either side of the landing made fast their tag lines to the vessel, the launching crew released the ship from its berth and both sides worked in concert to maneuvered the sizable hull on to cradles perched on the granite walls on either side of the channel. As the tide receded, the vessel was secured in its cradle precariously bridging the two banks of the river. 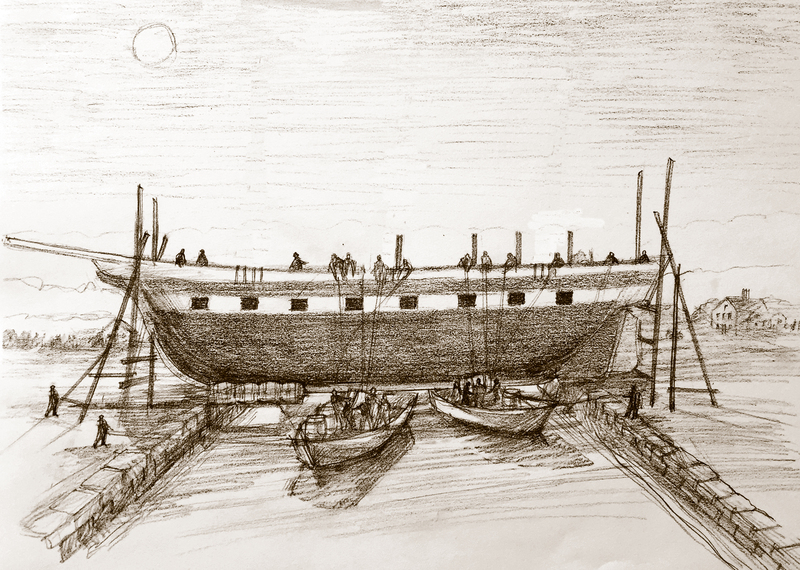 Once the hull of a vessel was positioned across the walls of the channel, and the tide went out, multiple teams of workers embarked on flat-bottomed scows and feverishly worked to secure, with rope and chains, empty whale oil casks to the bottom of the hull. Exactly how these casks were secured is not clear but the concept of elevating laden and unladen vessel hulls using this method was successfully carried out in other ports (one example might be ‘camels’ used in the port of Nantucket). With the casks securely positioned to the bottom of the hull, the returning high tide enabled the pilot boats and oxen teams to dislodge the ship from its cradles and maneuver it through the narrow channel south towards Hix Bridge. Hix Bridge got its name from Mary Hix who was proprietor of Hix’s Ferry (1710) until her son William built a permanent structure on the ferry’s location (1738). People like George Lawton, mill owner at The Head, built small sloops at the Head in the early days to trade with Providence. He and William Sisson, and numerous other town folk, objected strongly to the State Legislature regarding William Hix’s permanent stone bridge that crossed the east branch of the Noquochoke in 1738, calling it a ‘common nuisance’. The bridge prevented sailing ships from passing under it. Flat bottom scows and barges could pass under the bridge only at low tide in order to reach the Point and other ports. In 1739 Hix managed to get himself elected Representative to the Massachusetts General Court, for a term that lasted ten years. 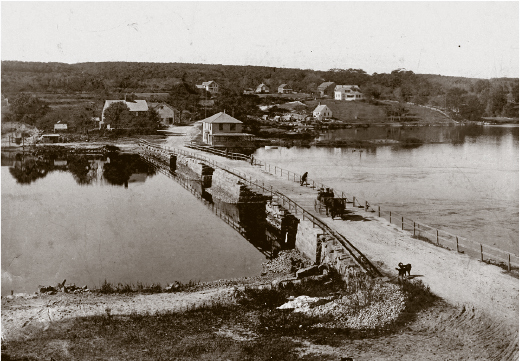 As a result of his efforts, the Legislature sided with Hix and his toll bridge was allowed to stand in the path of ship traffic approaching or leaving the Head. This didn’t deter some ship builders like Tabor, Tucker, Winslow and Mayhew who stubbornly planned and built full sized vessels at The Head. In 1804, John Avery Parker, Fredrick Brownell and Levi Standish purchased Hix Bridge and property on either side of the river and built many ships in that location. In 1814 Parker sold his stake in the property but shipbuilding continued around the Hix Bridge location for decades. With the focus that shipbuilding brought to Westport, and Hix Bridge in particular, the talent and ingenuity that it took to design, build, launch, portage and fit the ships to sail the world enabled these men to overcome nearly any natural or man-made obstacle. Hix Bridge was an impediment but not as insurmountable as it may seem today. It is highly likely that the old stone Hix Bridge was situated considerably lower on the landscape than today’s Hix Bridge and the western approach to the bridge was more conducive to portaging ships at the highest high tide than the eastern approach. To lend more credence to the western bridge approach, it is understood that the William Hix house, positioned near the west landing, was on rollers, which enabled oxen teams to move it out of the way during portaging activities. 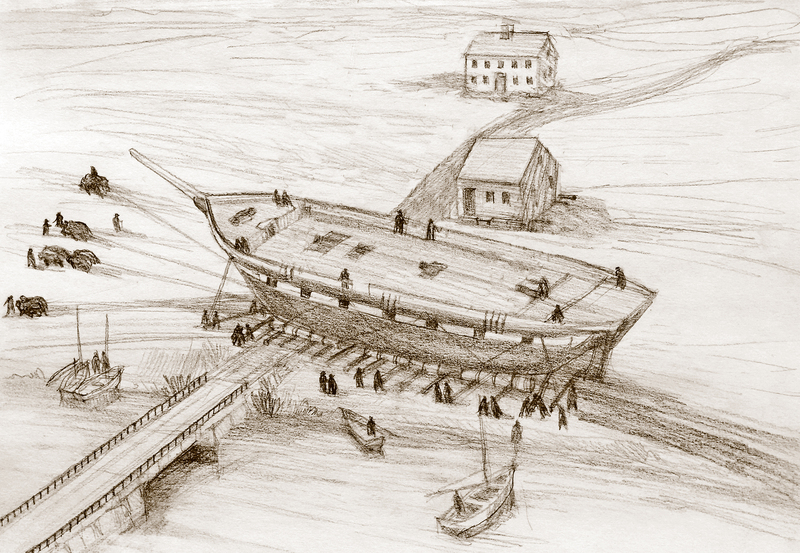 The following sketches suggest how portaging a two to three-hundred ton vessel over land might have been accomplished at Hix Bridge. 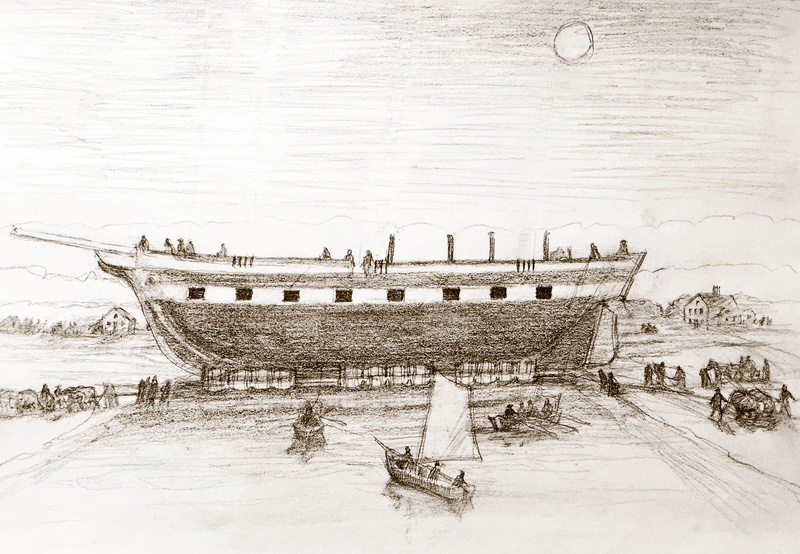 The first draws on the assumption that the ship, perched on its oil casks, would have been dragged by oxen teams in a precarious upright position, out of the north side of the river, over the western approach of the bridge and down the south side and back into the river. 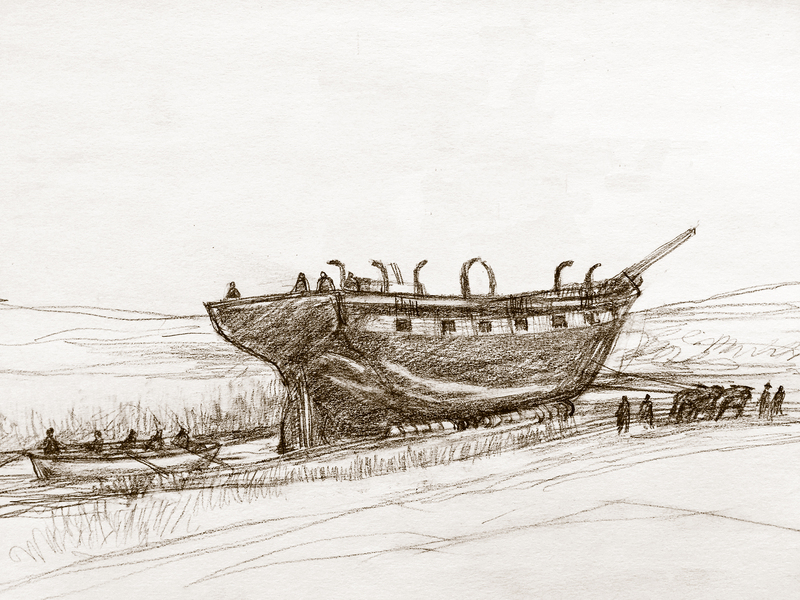 The second sketch illustrates another possible approach that might include removal of the oil casks from the hull, laying the hull in a ‘hove down’ position on tree trunk rollers and transport it powered by oxen teams from one side of the bridge’s access road to the other. Exactly how and in what fashion the portaging of the Phebe Ann, President II, Iris, Nye and Thomas Winslow at Hix Bridge was executed, as well as what other hurdles these shipbuilders were compelled to tackle in order to get their ships from shipyard to sea, can only be imagined. But, the fact seems clear, the convergence of craftsmen, woodsmen, farmers and engineers used determination and ingenuity to achieve the desired goal. Nantucket and New Bedford were the two most successful whaling ports in the world in the mid 19th Century but Nantucket had a problem. Its harbor was blocked by an impenetrable sandbar that prohibited whaling ships, especially fully laden ships, from entering the port. Lighters were required to offload thousands of barrels of whale oil, and the whaling merchants were clamoring for a solution. 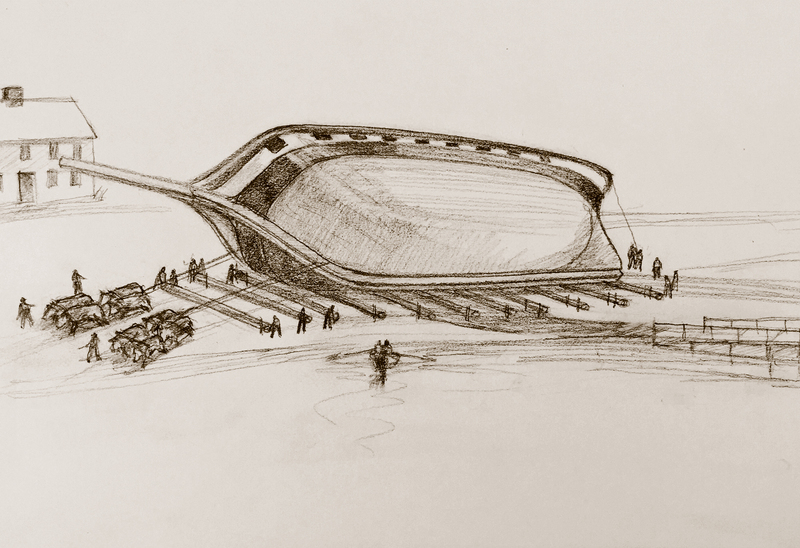 After decades of trial and error, in 1842 a man named Peter Ewer designed and commissioned a dual-hulled, steam operated device that would embrace both sides of a fully-loaded whaling ship, pump the water out of its hulls, and safely transport the ship over the sandbar to the port docks. One wonders whether Westport’s success using barrels to safely launch and portaging ships down the Westport River helped Mr. Ewer develop his camel concept? NOTE: A man named Abraham Lincoln patented the concept of the ‘camel’. In future discussions we will endeavor to look at the shipbuilding process and fitting out whalers for their worldwide voyages. This entry was posted in Nineteenth Century, Shipbuilding.